Preheat the oven to 180’c. Grease and line the base of a deep-sided rectangle tray or regular cake tin with baking paper. To prepare the topping, pour the melted butter over the base of the prepared tin and sprinkle with sugar. Arrange the nectarines cut side down, together with the blueberries and in a single layer over the base of the tin. 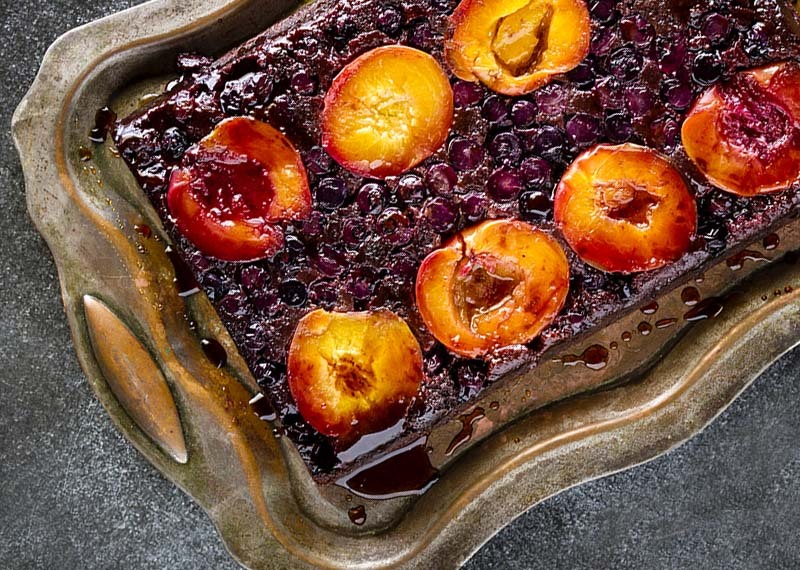 Carefully spoon over the nectarines in the cake tin and level off the top using a palate knife or spatula. Bake 35-40 mins until a cake tester is inserted into the center of the cake and it comes out clean. Allow to cool for 15 minutes in the cake tin or tray before unmolding.